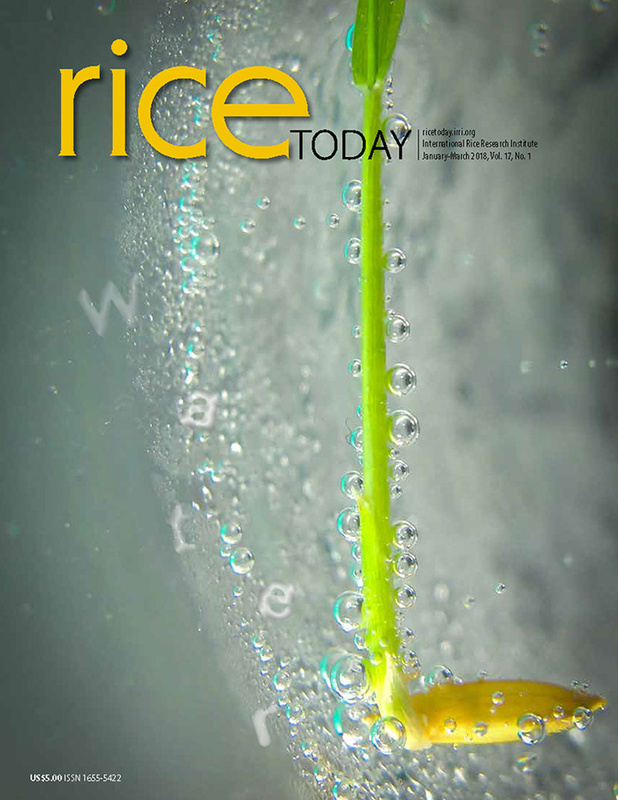 IRRI works with national partners to promote technologies that maximize water-use efficiency and to reduce rice’s ecological footprint through the Water-efficient and risk mitigation technologies for enhancing rice production in irrigated and rainfed environments (WateRice) Project. In cooperation with the Western Visayas Integrated Agricultural Research Center (WESVIARC), WateRice Project conducted a demonstration of laser-guided land leveling to farmers of Iloilo, Philippines. Laser-guided land leveling results in a precisely leveled field which brings about evenly maturing crops, higher yields better weed control, and reducing water and agro-chemical use. According to Joseph Sandro, IRRI assistant scientist and agricultural engineer, laser-guided land leveling increases yield by an average of eight percent. It has also reduced greenhouse gas emissions from saving on energy, reducing cultivation time and increasing input efficiency. During the demonstration, more than 100 participants were able to engage with mechanization scientists, Dr. Elmer Bautista and Engr. Joseph Sandro. Through these exchanges, participants learned valuable information on the estimated cost of laser leveling per field, the best time of the season to conduct it and the opportunities for higher profit as a result of the implementation of the technology in their farms. Although laser leveling requires significant investment, farmers are able to access the technology through appropriate business models for contract service provision. Participants were also given the opportunity to familiarize themselves with laser leveling equipment, and were encouraged to raise questions regarding its use and benefits. Mr. Valentin Sorilla, a WateRice farmer cooperator, said “after having my field leveled through laser-guided technology, I can say for certain that this is a good help to farmers”. Dr. Sudhir Yadav, WateRice Project leader, also added that laser leveling will be beneficial in Iloilo where almost 90% practice direct seeding method. Laser-guided leveling is also beneficial in irrigated environments. Presently in the Philippines, regional offices of the Department of Agriculture (DA) are offering laser-guided leveling services.In other countries, this technology is made available to smallholder farmers through the private sector service providers. The laser-guided leveling demonstration was held last 29 May 2018 at the WESVIARC demonstration field located in Hamungaya, Buntatala, Jaro, Iloilo City. It was attended by more than 100 participants composed of mainly farmer cooperators. Project staff from IRRI and PhilRice, and partners from the National Irrigation Authority, the Bureau of Soils and Water Management, DA-Rice Program, DA-Bureau of Agricultural Research, DA-Regional Field Offices, and the Office of the Iloilo Provincial Agriculturist were also present.